There aren’t too many “popular” day trip routes into the Boundary Waters but there is something about waterfalls that attracts the masses. There are a couple of these that see higher use than other areas of the BWCA and one of them is the route to Stairway Portage. At a USFS Cooperator meeting the officials mentioned the “Q and P” words about the popular day trip into Stairway Portage. What this might mean is having a quota of the number of groups per day that would be allowed to go to the falls. There would be some reservable permit to enter on a specific day, maybe even a specific time of day? Who knows, it was mentioned and that means there has been talk about it. When they first brought this up I cringed as this is the usual response. You see, over the years we’ve had new rules, laws and changes that usually involve having to pay money in order to try to make money. An example is the number of tow boats we can have and the fact we have to pay a percentage of our profits to the USFS. So, I cringed but after taking our BWCA canoe trip in that area last week I’m wondering if it might not be such a bad idea? I didn’t think that many people would visit the falls but I guess I’ve not paddled or hiked in that area much during the summer. Not many people make the drive all of the way to the end of the Gunflint Trail but quite a few make the trip up to mid-trail. Combine that with a number of resorts in the area and cabin owners who live in the area and there’s a fairly large population in the height of the summer. It’s an easy trip to see the falls with just one 80-rod portage between West Bearskin and Duncan and an easy 20-rod from Hungry Jack Lake to West Bearskin. A quick paddle across Duncan and your at the portage. There’s no need to carry your canoe down to Rose Lake unless you are continuing on your way. The area around the waterfall is beautiful. 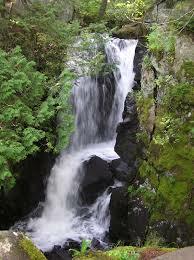 There are short hikes to scenic vistas, flat areas for picnicking and getting wet in the spray of the waterfall to enjoy. We saw quite a few different groups during the three times we were there(once to get into Rose, once as a day trip while on Rose, and once to get out of Rose). It certainly didn’t seem like a wilderness area with groups portaging through, taking photos and enjoying the scenery. The canoe traffic we saw while paddling Duncan helped make our decision easier to go camp in Rose Lake. Too many watercraft passing by on their way to see the falls for me to enjoy the solitude of the BWCA. Of course, I hate to limit the number of people that can enjoy such a place but if it is detrimental to those who have overnight camping permits then is it fair to them? I don’t know, it’s a good question, what do you think? 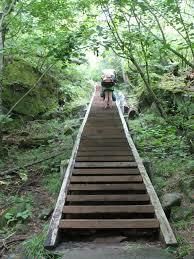 I’m happy I’ve been able to make the trip to Stairway Portage and look forward to those steps again, over 100 in all!